Have you ever eaten at a restaurant and found yourself lost in another world, or even time in your life? 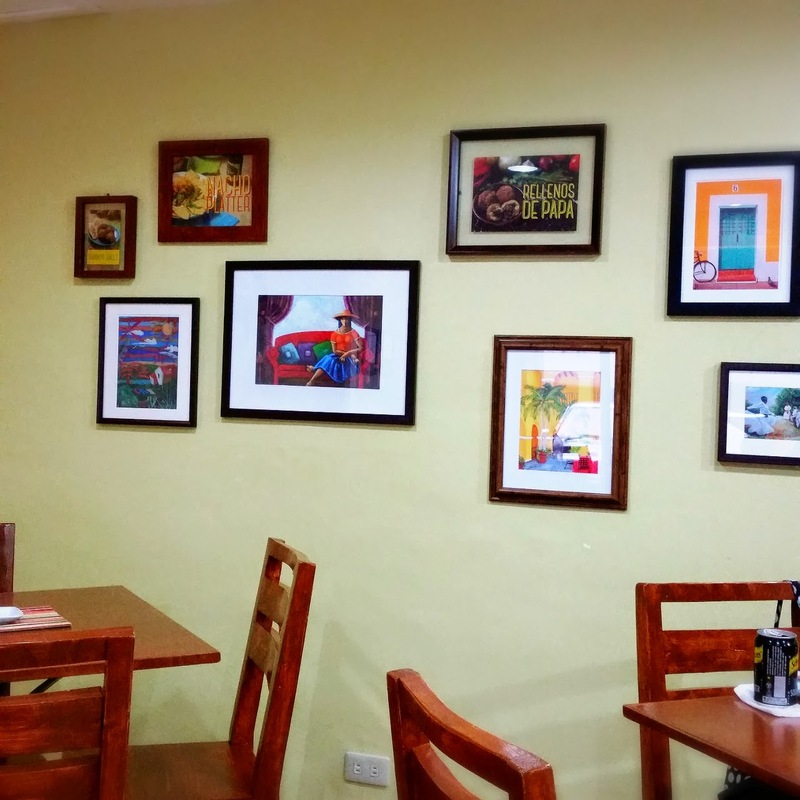 Food can be nostalgic, like my dining experience at Sofrito, a homey Puerto Rican restaurant in Salcedo Village, Makati. Dining at Sofrito one Sunday lunch felt like I was in 1997 at the home of Carla, my Puerto Rican friend from college. As soon as I walked into the restaurant, the bright colored walls, terra cotta-like floors, the Spanish music, and the smell of savory home cooking with cumin, garlic, plantains all added to the feeling like I was in their home in Miami. Carla and I met when we were in culinary school. 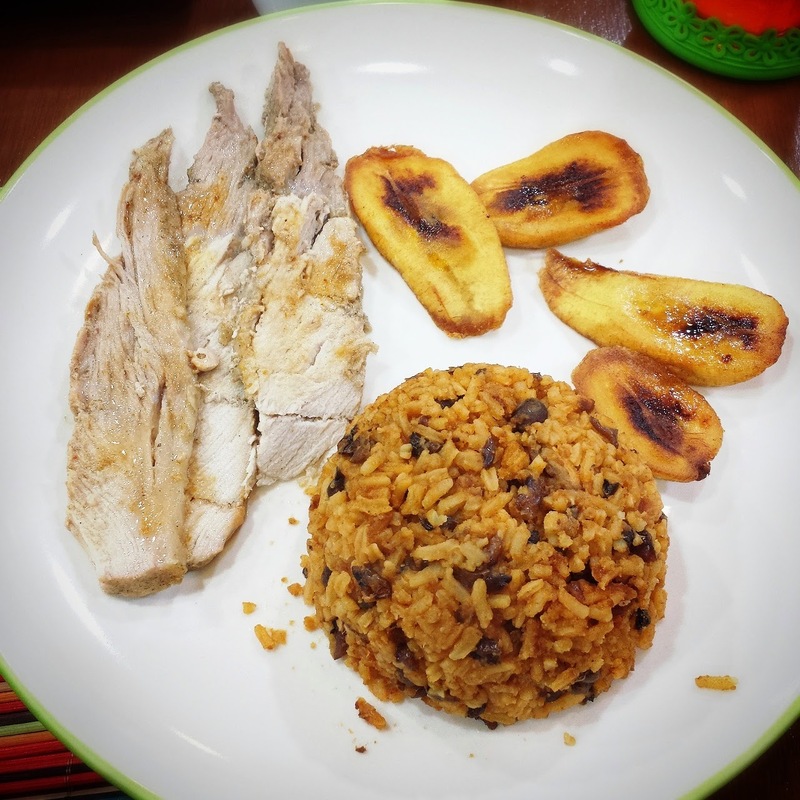 It was when a few friends and I visited her in the summer of 1997 that we all truly learned the art of her family's and most Puerto Rican cuisine – the sofrito. The "sofrito" is a blend of herbs and spices that is used in their cuisine. Historically, sofrito was brought over to Caribbean by the Spaniards who settled there in the 1400's. Sofritos can range in color, and flavor due to the ingredients used. Many consider this to be the base or the heart of all their recipes. A key ingredient to their sofrito are the aji - chili like pepper and culantro similar to cilantro, only it has a richer and more potent flavor. You'll know the aroma of a sofrito once you've smelled it; it awakens the senses and heightens the flavor you are about to experience. It’s been a long time since I’ve visited Carla, let alone spoke to her. But I remembered her family throughout my entire lunch at Sofrito. The Chef and Co-Owner of Sofrito, Millie is 100% Puerto Rican and from Miami. Her husband and business partner is Jay. Both retired from the US to Manila to spend time with family. When I asked them what made them want to open this restaurant, they said that it was because their nieces enjoyed her baking and cooking. Seeing their happiness in every bite coupled with missing Puerto Rican food led to the opening of Sofrito. No wonder it is one of the best yet simplest dining experiences I've had in Manila. It was built from the heart! 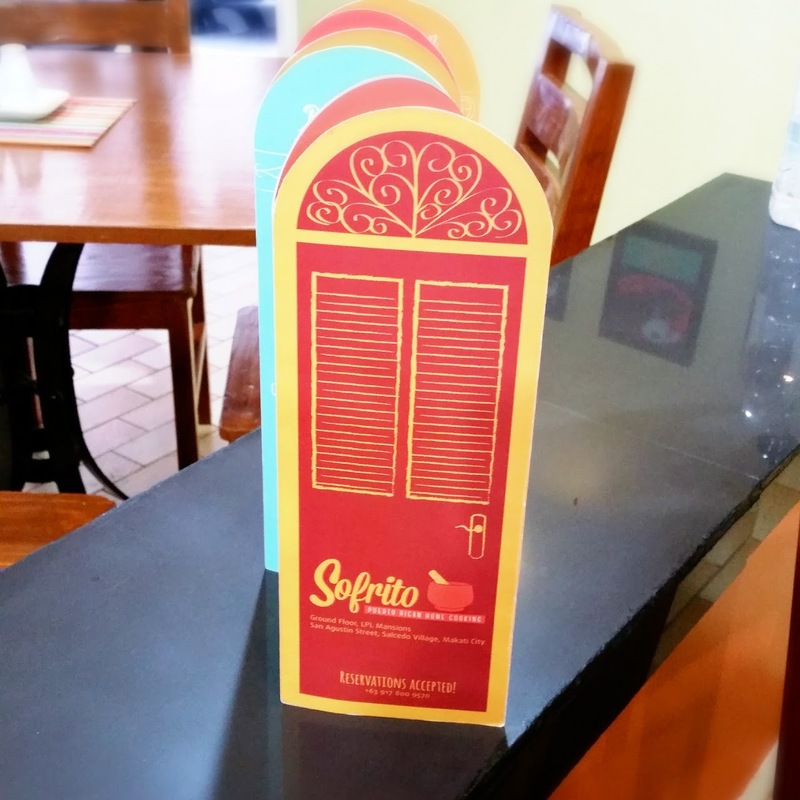 Softito's menu is as colorful as the food they serve, as with its friendly and attentive staff. When placed in front of us, it took me quite some time to decide on what to order. Luckily, I had my best friend with me so we were able to try a bunch of things to truly sample some of what the menu has to offer. Everything we ordered was a true winner. For starters, we had Beef Empanada, Rellenos de Papas and the Asopao de Pollo. 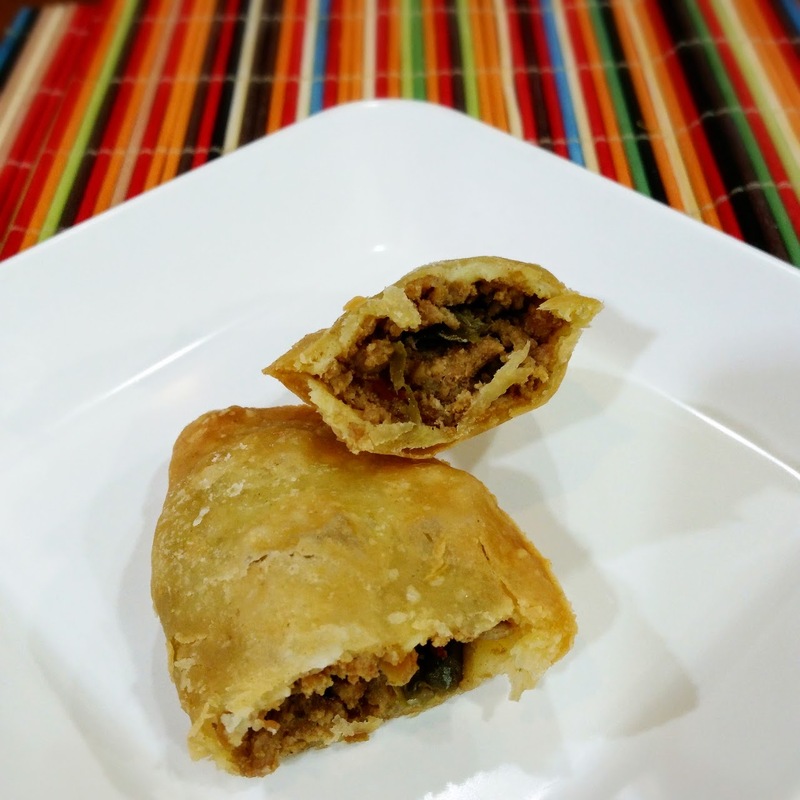 The Beef Empanada (Php100 for 3 pieces) had that perfect blend of flakiness, crispness at the initial bite, with softness just before you get to the filling of seasoned ground sirloin. Paired with spicy banana ketchup, each bite was one step closer to Miami. The Rellonos de Papa (Php150 for 2 pieces) is a bit heartier. 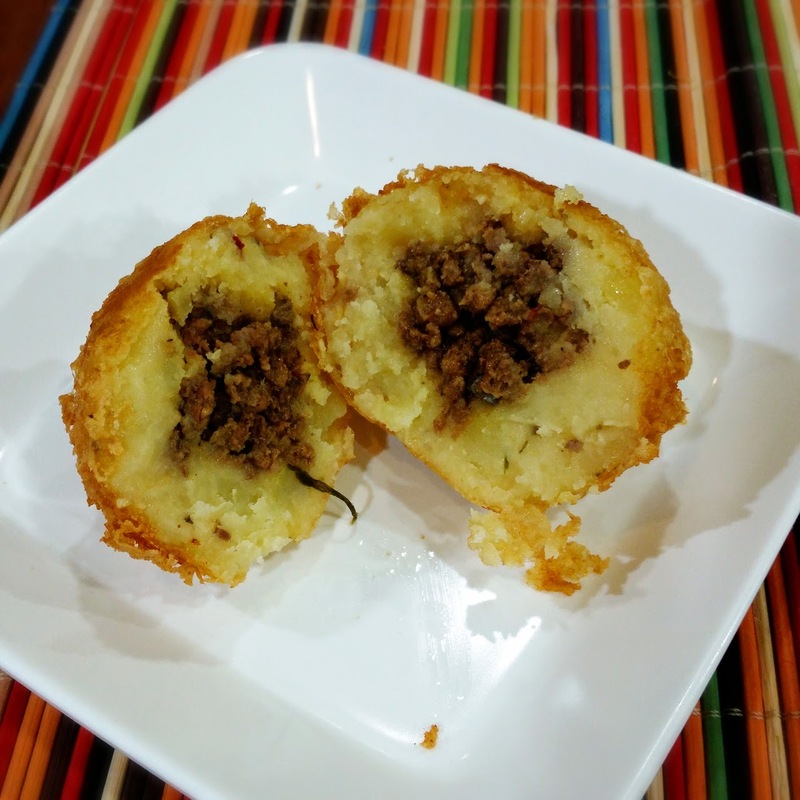 Picture a round ball made of savory mashed potatoes with a ground meat filling in the center and fried golden crisp. Their Asopao de Pollo (Php150 for small order or Php300 for big order) was for me most amazing culinary blend of genius! 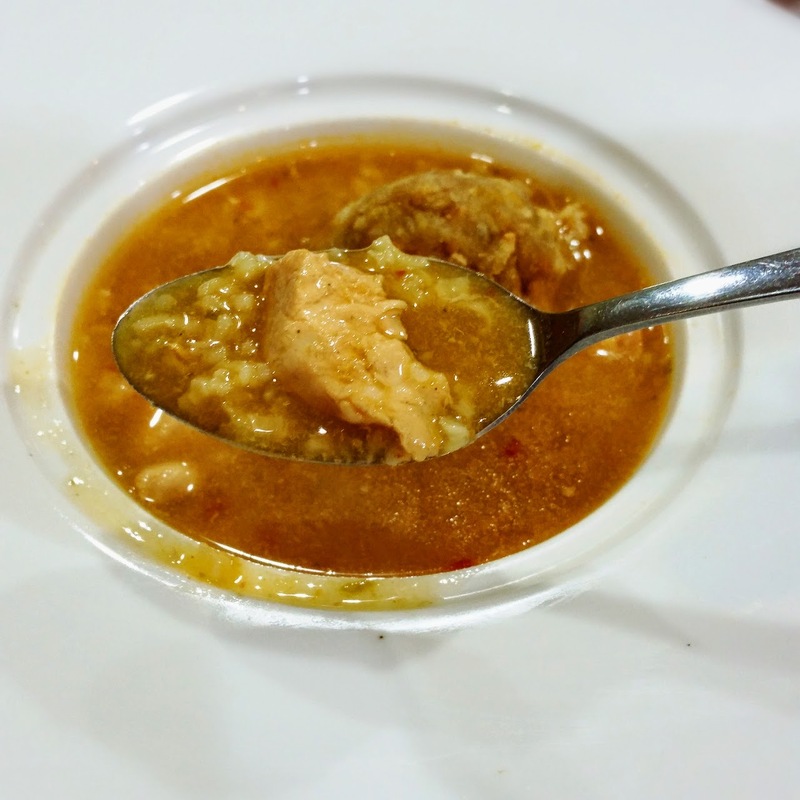 It is a chicken based soup, with real chicken chunks (not bites), rice, and includes a Mofungo ball. A Mofungo ball is ground up plantain and chicharon – when combined it created the texture, depth and a flavor that explodes in your mouth. From crisp to soft it's truly a mélange of flavors dancing in your mouth. When you couple this with the music in the background, it won't be far off to be dancing to the beat in your mouth. My friend ordered the Arroz con Frijoles - Platanos Manduros y Pernil (Php400) as his entree, which he liked. It was a full meal of lechon asado (pernil) with rice (arroz) and beans (frijoles), as well as sweet bananas (platano manduros). The Pernil had all the flavors and textures of authenticity; garlic, spices, tenderness and crispness. Paired with the rice and beans that had the right amount of cumin, this is a dish that could withstand any culinary competition and come out a champion. Millie told me she lets the meat sit in the marinade for 2 days – and it shows. 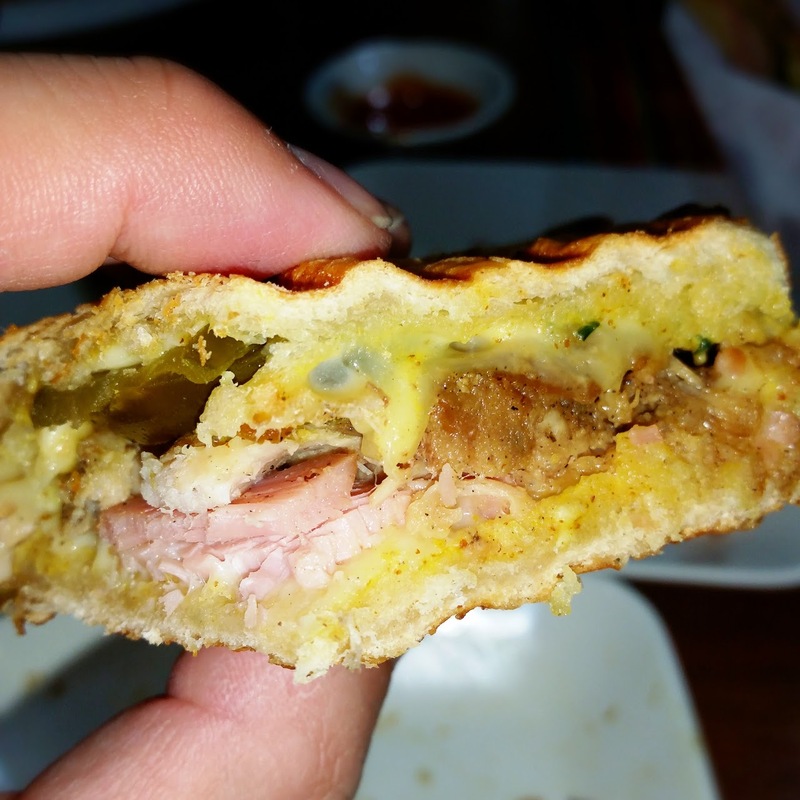 Because of my love of food and having just watched the movie Chef, I had the Cuban sandwich (Php250). Man! It was just what the movie Chef portrayed so well… crisp golden grilled bread, roast pork asado, ham, Swiss cheese, pickle and mustard. Cuban sandwiches became popular in places like Miami; areas where Cubans migrated to during the Communist Revolution in Cuba. They were considered the lunch food for many Cuban workers. Eating this sandwich was by far the bite that triggered my memory and reminded me most of my Miami trip, for it was on that trip that I learned about the Cuban sandwich as part of many late night/early morning eating after a few nights out on the town. I could almost feel myself dancing the Salsa – reminiscing the first time I had this sandwich where I was literally dancing to no music on the sidewalk with my friends. The dining experience was so filling; I didn't have time for my own dessert. 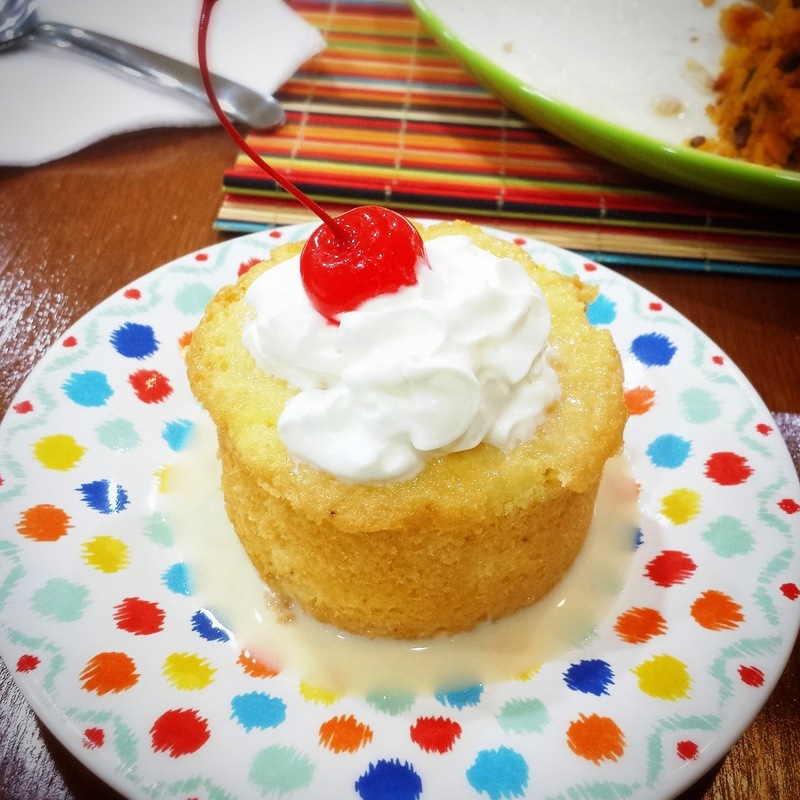 My friend and I shared the Tres Leches Cake (Php200) - and true to its name it is – soaked in milk and moist and creamy. Since then, I've been back twice and each time with friends who've now been converted into Sofrito lovers! And each time I come back not only do I enjoy the food, but more so the time I spend talking with Jay and Millie. The similarities of both living in the United States for most of our lives and coming back to Manila have definitely helped build rapport, but it's the love of food that keeps us connected. We do things because we enjoy it, we share our passion and our hearts. Or in Millie's case it's Sofrito - the heart behind her cuisine. Sofrito Authentic Puerto Rican Restaurant is located at the Ground Floor, LPL Mansion, 122 San Agustin St., Makati. It is open Mondays to Saturdays from 11:00AM to 10:00PM, and on Sundays from 12:00PM to 8:00PM. They accept reservations via mobile at +639178009570 or email at sofritocafe@gmail.com. For more info, visit their Facebook page at https://www.facebook.com/sofritocafe.